According to the Native American people, dreams are messages that come from the sacred spirits. There are different stories pertaining to Native American dream catchers and these are variations of the legend as seen by different Native American tribes. One version states that the hole in the middle of Native American dream catchers allows the good dreams to be passed on to the sleeper, while the web traps all of the bad dreams, and then at the first light of morning the bad dreams would disappear. 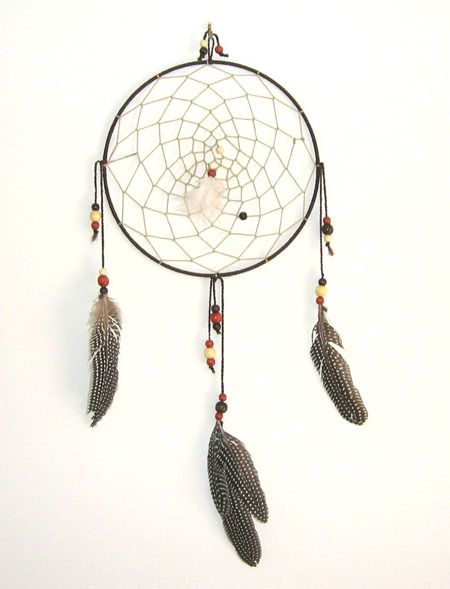 Another version of the story about Native American dream catchers says that the web will capture all of the good dreams and let the bad dreams go out through the hole. 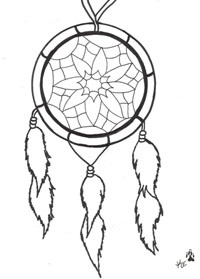 Dream catchers were thought to have originated with the Ojibwe tribe, also known to many as the Chippewa Indians. And there are many stories about how the dream catcher came to be. The Ojibwe tribes used to tie strands of sinew in webs around a tear-shaped frame and then they would hang the dream catcher above a sleeping Native American child’s bed to help protect them from nightmares. Normally Native American dream catchers are fairly small and are made by bending wood (originally birch) and sinew string tied together. A feather was usually seen hanging from the webbing. Today it is very common to see Native American dream catchers in many places. You can see them hanging from car mirrors, on people’s walls as decorations, and even in many modern day tattoo designs. Many are mass produced and sold as decoration but it is still possible to find real authentic hand made Native American dream catchers. There are thousand of Native Americans that live on reservations and others that live on their own that are still Native American traditionalists, and among these Native people you can find these authentic dreamcatchers. Over time the dreamcatcher was also adopted by many other Native American tribes’ throughout the land and they gained a lot of popularity as beautiful decorations in the 1960’s and 70’s. When you find somewhere to obtain an authentic dream catcher nowadays it will usually come with a certificate of authenticity with the name of the Native American artist who made the dreamcatcher on it, this will help ensure you it is a real Native American dreamcatcher.